Vanity Fair July! Can’t wait. Still kind of obsessed with these two. 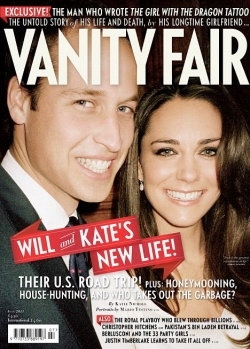 The cover is an unseen and unpublished photo of the royal couple from Mario Testino‘s engagement-portrait session. Not the most exciting image in the world but the article sounds pretty interesting… Plus, now VF can boast to being the first glossy magazine in the US to have them on their cover outside of the tabloids. This entry was posted in Media/Publishing and tagged Glossy Magazines, Kate Middleton, Kate Middleton and Prince William's Vanity Fair Cover, Magazines, Media, Prince William, Royal Couple, Royal News, Royal Wedding, Royals, Vanity fair, Vanity Fair Cov. Bookmark the permalink.